. oni 鬼 Japanese demons .
. yooki 妖鬼 Yoki - Yokai Monster Demon .
. yuurei 幽霊 Yurei ghost, Geist .
. Yokai 妖怪 Monsters - Introduction - . 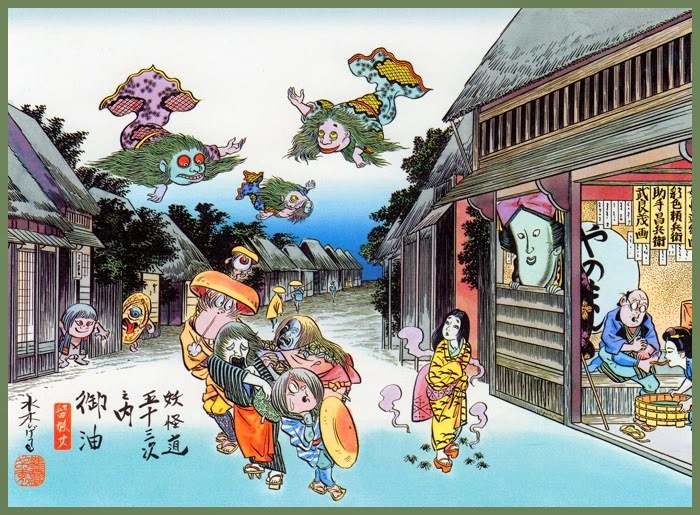 CLICK for more yokai photos !
. 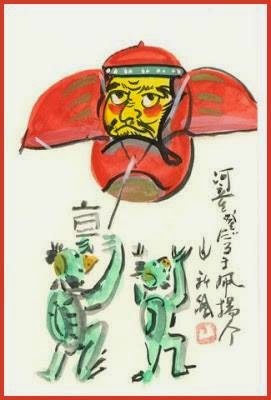 kidan 鬼談 Demon stories, Yokai and Demon talk . Rokurokubi, Rokuro-Kubi ろくろ首 "moving head"
. Shrine Yokai Jinja 妖怪神社 and Yokai Ema 妖怪絵馬 votive tablets .
. Haiku and Senryu about Yokai monsters　俳句　川柳 .
. Buson Yokai Emaki 蕪村妖怪絵巻 Buson Monster Scroll .
. Yosa Buson 与謝蕪村 (1715 - 1783) Painter and Poet . O-Bake, お化け, Literally means, "transforming thing." Anything that is fearful or super-large or otherwise out of the normal range is called O-Bake.
. Abura-bo 油坊 Oil Priest / 油坊主 abura boozu .
. Amazake Babaa 甘酒婆 "Amazake hag" "Sweet Sake Hag" .
. Amemasu アメマス / 雨鱒 "Rain Trout" .
. Ashinaga Tenaga 足長手長 "Long Legs, Long Arms" .
. Amabie アマビエ mermaid .
. Amanojaku, Ama no Jaku, Amanjaku 天邪鬼 Heavenly Evil Spirit .
. bakezoori, bakezōri 化け草履 Bake-Zori, Sandal Yokai .
. choochin obake, chōchin-obake (提灯お化け, "paper lantern ghost" .
. Daidarabotchi ダイダラボッチ / Daidarabotcha ダイダラボッチャ / デーデッポ Deedeppo .
. futtachi 脛立 /フッタチ / 経立 Futtachi - old hen or monkey Yokai .
. Ganbari Nyūdō 加牟波理入道 Yokai God of the Toilet . Gangi kozo 岸涯小僧 "riverbank priest boy"
They are close relatives of the much more well-known kappa.
. Gagoze ガゴゼ Yokai-Monk from Gango-Ji, Nara .
. Goizo and Goizoo-iwa ごいぞう岩 the Goizo Rock .
. Hahakigami ははきがみ hōkigami 箒神(ははきがみ) Hokigami, Deity of the Broom .
. Hakusanboo 白山坊 Hakusan-Bo, Fox Yokai . a body like a cow's, a head like a man's. - - - - - . Hakutaku 白沢 in Shinagawa, Tokyo.
. Hakuzooshu 伯蔵主 Hakuzoshu / Hakuzosu Fox . and 多久蔵主 (たくぞうす) Takuzosu. Hakuzosu Inari 伯蔵主稲荷.
. Hatahiro 機尋 / はたひろ loom-spun, serpent .
. Heikegani crab 平家蟹, ヘイケガニ (Heikeopsis japonica) .
. hina 雛 / お雛様 / 烏の雛 Hina dolls and chicks .
. hitodama　人魂 (hidama) "human soul" "soul flame" .
. Hitotsume kozoo 一つ目小僧 / 一ツ目小僧 Hitotsume Kozo, Little Monk with One Eye .
. hoo 封（ほう）Ho Yokai and elixir for Ieyasu .
. Hyoosube 兵主部 Hyōsube Yokai, Hyosube / ヒョウスンボ .
. Ibaraki Dōji 茨羅鬼童子/ 茨城童子/ 茨木童子 Ibaraki Doji / Ibaragi Doji .
. Imogura イモグラ Satsuma imo sweet potato monster .
. Inugami 犬神 "Dog Deity" Dog Monster .
. Ippondatara, Ippon-datara 一本ダタラ, 一本タタラ Ippon tatara, Ippondatara .
. Jooga 嫦娥 Joga, Chang'e / Kooga 姮娥 Koga, Heng'e .
. kaijuu 怪獣 Kaiju - mythological beasts and animals - Legends .
. Kamaitachi 鎌鼬 "sickle weasel" cold cutting wind .
. kasa, karakasa obake　から傘お化け / 唐傘お化け umbrella ghost .
. Kasha 火車 Kasha Demon "burning chariot" .
. Katsura-Otoko (桂男): the Wig Man .
. Kawauso 獺魚 / 獺、- 川獺 - カハウソ - かハうそ Mister Otter .
. Kidoomaru - Kidōmaru 鬼童丸 Kidomaru - legendary magician .
. kijimunaa キジムナー Kijimuna and kenmun 水蝹 Kenmun . - . kenmun ケンムン from Kagoshima .
. kodama 木魂 / 木魅 / 木霊 tree spirit (and echo) .
. kodama nezumi コダマ鼠 / 小玉鼠 Kodama Nezumi Yokai monster - Little Ball Rat .
. Kokkuri 狐狗狸 Table-Turning . - - - - - (ko 狐, foxes; gu/ku 狗, tengu; ri 狸, tanuki).
. Kosamebō 小雨坊 Kosamebo, Kosame-Bo "Light Rain Monk" .
. kosode no te 小袖の手 Hands of a Kosode robe .
. Mikaribaba, Mikari Basan 蓑借り婆さん / ミカリバアサン "old hag Mikari" .
. Mizuchi 蛟 water yokai .
. Mochi 餅　rice cakes and 妖怪　Yokai monsters .
. Momiji, kijo momiji　鬼女紅葉 female Demon called Momiji .
. namekujira なめくじら slugwhale, namekujiri なめくじり slug .
. narigama 鳴釜（なりがま）pot who calls out .
. ningyo 人魚 "human fish" and Yao Bikuni 八百比丘尼 .
. Nobusuma 野衾 (のぶすま）"wild quilt", "wild blanket" .
. Nue 鵺 a mythological beast .
. Nure-onna 濡女 "Wet Woman" dragon yokai . - - - - - . oni omamori 鬼お守り　Demon Amulets .
. nopperaboo, noppera-bō のっぺら坊 Nopperabo, faceless ghost .
. Onibaba 鬼婆 the Demon Hag at 黒塚 Kurozuka .
. Oosuke, ōsuke, Daisuke 鮭の大助 / 鮭の大介 the salmon king .
. Osakabe Hime 長壁姫, 小刑部姫, 小坂部姫 from 姫路城 Himeji castle .
. Ryūtō, Ryuutoo 龍燈 Ryuto "Dragon Lantern" .
. Shinchuu, Shinchū 神虫 Shinchu, "The Divine Insect" silkworm moth . Shiranui Monogatari 白縫物語 , a kaijuu 怪獣 sea monster, illustration by Utagawa Kunisada.
. Shuten-dōji, Shuuten Dooji 酒呑童子 Shuten Doji .
. Suiko 水虎 Water Tiger, Water Beast .
. Takaboozu 高坊主 Takabozu .
. taki rei-oo, taki reiō 滝霊王 / 瀧霊王 Taki Reio Spirit-king of the waterfall .
. Tengu 天狗 - karasu tengu　烏天狗 Tengu with a beak .
. umiboozu, umibōzu 海坊主 Umibozu, "sea monk", "sea bonze" .
. ushioni, ushi-oni うし鬼 / gyuuki 牛鬼 "bull-demon" .
. Ushirogami ウシロ神 / 後神 / 後ろ髪 / うしろがみ Deity coming from Behind .
. Yaegakihime, Yaegaki-Hime 八重姫 Princess Yaegaki and Takeda Katsuyori . (8 legends to explore) - probably ジャッカル jakkaru, jackal, or maybe a fox 狐.
. Yamabiko (Yamahiko) 山彦 / やまびこ Mountain Deity and Yokai .
. Yamachichi 山チチ / 山地乳 Yamachichi "mountain breast" .
. Yamanba, Yamauba 山姥 and 山姫 Yamahime, "Mountain Hag" . yukionna, yuki onna 雪女 (ゆきおんな) "snow woman"
. yamaotoko, yama-otoko 山男 "Mountain Man" monster .
. O-Bake no Gakko おばけの学校 School for Monsters and Demons . a man with his face on his stomach. He steals and kills. 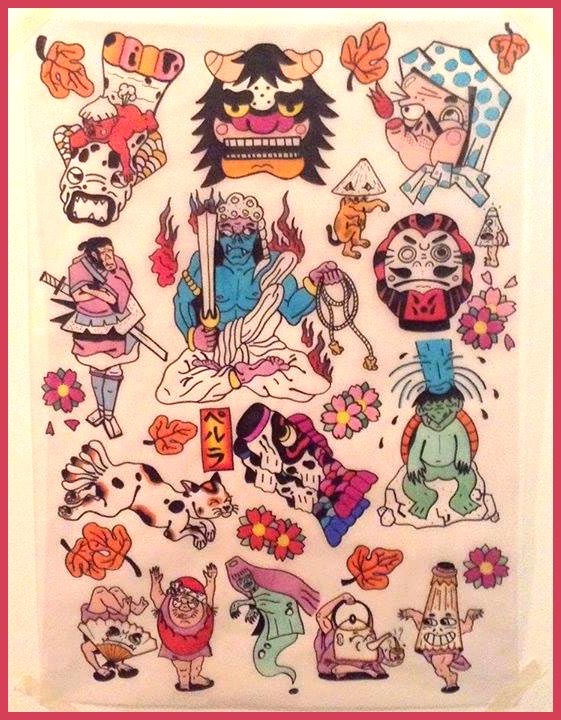 Watch out for the Kappa, Fudo Myo-O and even Daruma san! If you want to hear a terrifying ghost story this Halloween, look to Japan. The country has an uncanny tradition of hair-raising tales known as kaidan, which samurai often told to show off their courage. According to tradition, the Edo period warriors would gather at night in a room lit by 100 candles. Each would blow one out after sharing his own ghoulish encounter, until a single flame was left burning. It was up to the last brave soul to snuff it out — if he could. 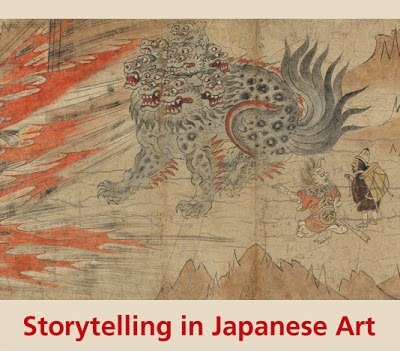 Unsurprisingly, these ghost stories piqued the artistic imagination, and many printmakers in 18th- and 19th-century Japan translated them into colorful woodblock prints. Some are now on view in the Art Institute of Chicago’s Ghosts and Demons in Japanese Prints, an exhibition not meant for the easily spooked. Among images of the demon queller Shoki fighting off goblins, the show includes several eerie prints from Katsushika Hokusai’s series One Hundred Ghost Tales (Hyaku Monogatari). One from 1831 depicts the murdered actor Kohada Koheiji pulling down the mosquito netting around the bed of his treacherous wife and her lover. Another shows the gruesome demoness Warai Hannya, who represents the soul of a jealous lover, holding the decapitated head of a child. You can see why even burly samurai warriors might have gotten a little freaked out.